PARIS (Bloomberg) -- Renault SA, France's second-largest carmaker, posted a first-half profit that beat estimates as the global economic recovery boosted demand for autos. Net income was 780 million euros ($1.02 billion), compared with a 2.73 billion-euro loss a year earlier, the carmaker said in a statement distributed at its headquarters in the Paris suburb of Boulogne-Billancourt. Analysts had expected profit of 377 million euros, based on the average of estimates compiled by Bloomberg. Sales rose 23 percent to 19.67 billion euros. The French carmaker's profit rebound follows improved earnings announced earlier this week at Volkswagen AG and domestic rival PSA/Peugeot-Citroen SA. Renault slashed its net industrial debt by 1.26 billion euros, or 21 percent, to 4.66 billion euros in the first six months. The move reduces financing costs ahead of a challenging second half for carmakers as more European governments withdraw scrapping incentives. Renault predicts a full-year European market contraction of between 7 percent and 9 percent. “The third quarter will be important in determining visibility for the full year and the start of 2011,” Renault said Friday. The maker of Megane, Clio and Laguna cars recorded first-half recurring operating profit of 780 million euros, or a 4 percent return on sales, compared with a 620 million-euro loss a year earlier. The main auto division recorded a 2.2 percent operating margin and sales of 18.78 billion euros, a 24 percent gain, Renault said. Purchasing cost cuts contributed 330 million euros to earnings, while lower raw material costs saved an additional 112 million euros. 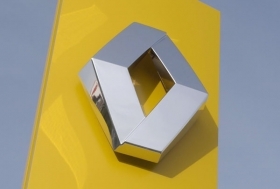 The manufacturing arm's free cash flow was “slightly ahead of plan” at 1.42 billion euros, compared with 848 million euros a year ago, Renault said, without elaborating on the internal objectives. The French carmaker recorded 823 million euros in overall net income -- before the deduction of earnings attributable to shareholders of other companies that Renault consolidates in its accounts. Nissan Motor Co., Renault's 43 percent-owned Japanese affiliate, Thursday reported a profit of 106.6 billion yen ($1.22 billion) for its fiscal first quarter ended June 30, compared with a 16.5 billion yen loss a year earlier.